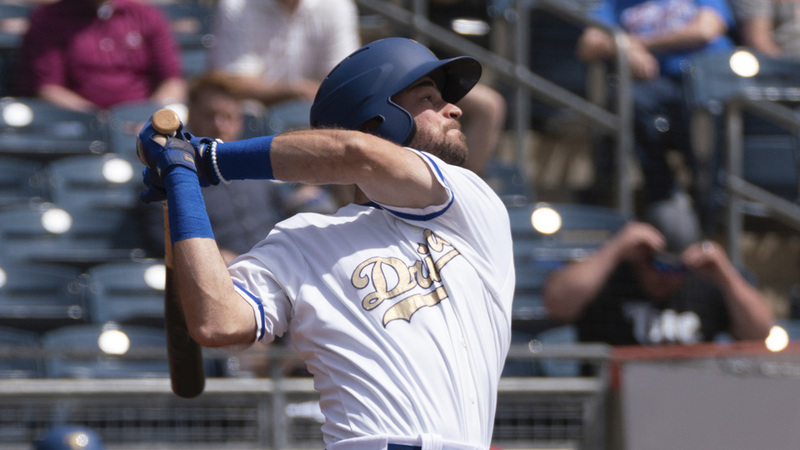 TULSA, OK - On a windy afternoon at ONEOK Field, the Tulsa Drillers concluded their season-opening homestand by producing their biggest offensive game of the young season. Tulsa scored runs in each of the first five innings on its way to producing season highs with 16 hits and 12 runs scored. The result was a 12-6 victory over the winless Springfield Cardinals. The victory was the fourth straight for the Drillers after opening the season with three straight losses. The Cardinals fell to 0-7 on the season, setting a record for worst start in franchise history. The offensive outburst began early for the Drillers when they plated four runs in the bottom of the first inning. After the Travelers took 1-0 lead in the top of the first, Zach McKinstry drew a leadoff walk and scored when Omar Estevez followed with a triple, extending his hitting streak to seven straight games. After Cristian Santana singled home Estevez, former University of Oklahoma quarterback Cody Thomas belted his first Double-A home run to give Tulsa a 4-1 lead. The Drillers scored single runs in the second and third innings before posting their second four-run outburst in the bottom half of the fourth. Thomas picked up another RBI when he drew a bases-loaded walk, and Josh Thole singled home two more runs. Pitcher Dustin May joined the fun when he dropped a base hit into right field to bring home the fourth run of the inning and the tenth of the game. In the fifth, Chris Parmelee doubled and scored on a triple by Thomas. Walker plated Thomas with a base hit to close out Tulsa's big offensive day. An early season pitch count kept starting pitcher Dustin May from getting his first victory of the year. The right-hander departed after facing the first three batters in the top of the fifth inning. Louis Head followed May to the mound and allowed one run on three hits to pick up the victory. Reliever Luis Vasquez closed out the win for Tulsa by allowing only one run over the final three innings to pick up his first save of the season. *Each of the Drillers nine starters got at least one hit, including May. *Thomas enjoyed his best game of the season, going 2-3 with 3 runs scored and 3 runs batted in. *Logan Landon and Cristian Santana both had three-hit games. *Estevez has now hit safely in all seven games this season. *It was a tough day for fly balls and pop ups as a south wind of up to 35 m.p.h. blew in from right field throughout the game. *Tulsa will now embark on its first road trip of the season, a seven-game trip to Arkansas and Springfield. UP NEXT: Tulsa at Arkansas, Thursday, April 11, 7:10 PM at Dickey Stephens Park in North Little Rock, AR. RHP Yadier Alvarez (0-1, 9.00 ERA) versus Zac Grotz (0-0, 0.00 ERA).